William Benjamin Hogan was one of the legends of golf worldwide, being one of the first to enter the Hall of Fame of golf, in addition to winning dozens of championships tops including some Masters, with an excellent record and great technique. And now you can have at hand the book “Ben Hogan’s Five Lessons”, where you can learn some of the best tips to play golf the right way. Written by Ben Hogan and Herbert Warren Wind where you will find a lot of information about golf and some recommended techniques to improve your game. It talks about the importance of the movements that in golf it calls swing and also other tips that will be very beneficial and of great help to improve. Some of the fundamentals of which the authors speak are “the grip”, which is the pulse of the action of the golf swing; the posture and some positions before and after the swing. 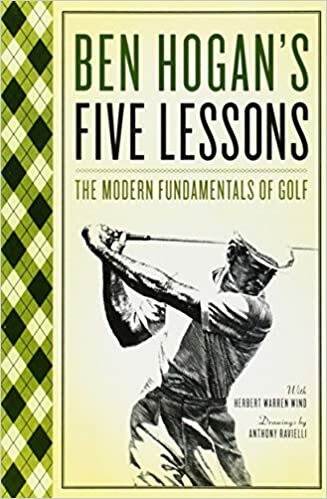 This book can be a great help in case you’re interested in starting to play golf and what better than the best golf player, as Ben Hogan was, be the one to recommend you to do. The book despite it was written many years ago, it’s still selling as if it had been released yesterday. In addition, they have released some updated editions. But you will really enjoy reading and also, you can practice different things to take advantage of your service and many other tips that will come excellent. The book also serves as a clarification of various myths and incorrect techniques that have been applied in golf and have not really prospered. The most important thing is to do everything with a lot of passion and that you like to do it so that you can enjoy it more and not be so forced. The writing is very well done, although they describe many tricks and techniques, they explain it with a simplicity that many people can understand, even if they do not know much about the world of golf.